CNN's marathon coverage of the Iowa caucuses ran several hours overtime than initially planned, and here's why. In a nutshell, the margin of victory is one of the closest ever for a GOP presidential contest. 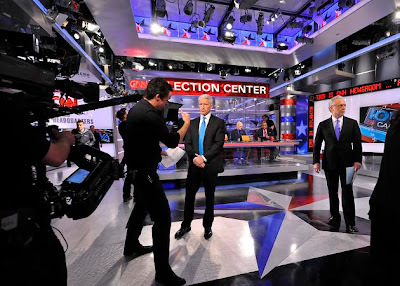 Forget the flashy graphics, revamped magic wall, redecorated Studio 7, virtual Weebles and every other gimmick CNN threw at its Iowa caucuses coverage Tuesday, it was two GOP officials who appeared to steal the show... and possibly handed CNN the opportunity to be the first network to reveal the reasons behind the confusion that led to the delayed results announcement. As we were left with the final result hanging in the balance, Wolf Blitzer and John King tried to get to the bottom of the missing caucus information from Clinton County, Iowa, by talking to Edith Pfeffer, Chair of the Clinton County Republican Party, and Carolyn Tallet. The live to air phone conference immediately spawned Twitter buzz with #Edith peaking at number two on the social network's trending section in the U.S. Video of the conversation is in the player below. "As Erin Burnett tried to explain a pie chart showing the way voters had veered related to what they considered the most important issue, using her new Magic Wall move, “the flick.” The “flick” somehow did not get the pie chart onto the second screen as attempted until the third try, by which Burnett and Gloria Borger were cracking up. Anderson Cooper seemed to sense that all was lost and asked, “have we all just given up?” to which Ali Velshi responded “it is evident from the social media screen that people are going to sleep.” For no apparent reason, this made Cooper explode in laughter. “Again with the social media screen? This is the third hit and I still don’t understand what the hell this thing shows!” Velshi then tried to explain– but not before telling Roland Martin to stop laughing. It didn’t really seem to stop him– or anyone else on the set– from laughing." Watch video of the shenanigans listed above in Mediaite's video here. 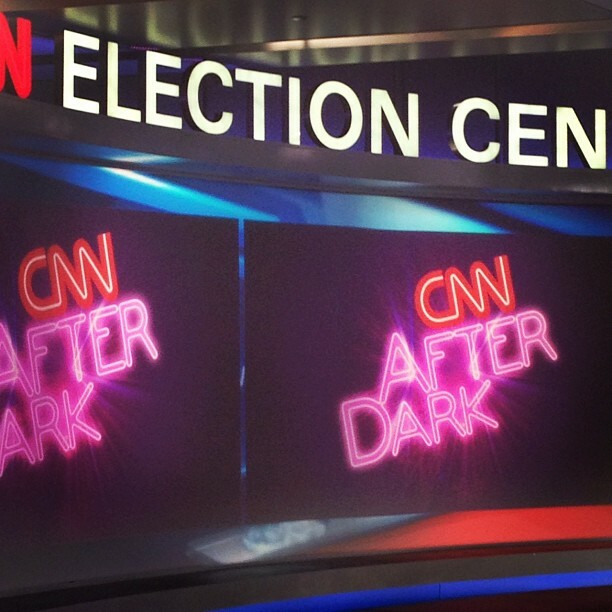 The lighter moments of CNN's coverage post-midnight soon led to someone suggesting a new show: "CNN After Dark". CNN's anchors, pundits and producers soon got in on the act, with a new logo for the proposed show designed on the hop and displayed on the projection screens in Studio 7. Image credit: CNN contributor Dana Loesch. 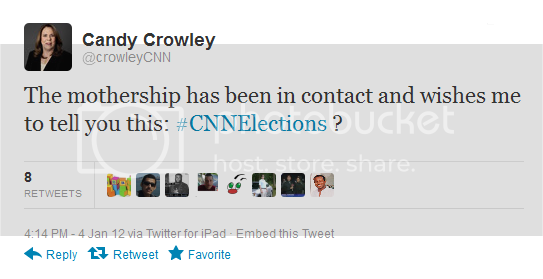 The CNN superstar didn't seemed too concerned by the reminder, with subsequent tweets still published sans the hashtag. While most of the memorable "Youtube moments" occurred post-midnight (eastern), it was hard to miss this little nugget at the start of Tuesday nights coverage. CNN unveiled a brand new ident that briefly points to the network's election coverage history. You can view the "CNN America's Choice" ident in the video below. CNN eventually wrapped up coverage shortly after 3:30am (eastern) - the last of the cable networks to sign off by more than 30 minutes. CNN Political Coverage - Our forum members weigh in on CNN's Iowa caucuses coverage.